Farewell quotes might get you through a difficult time in your life. 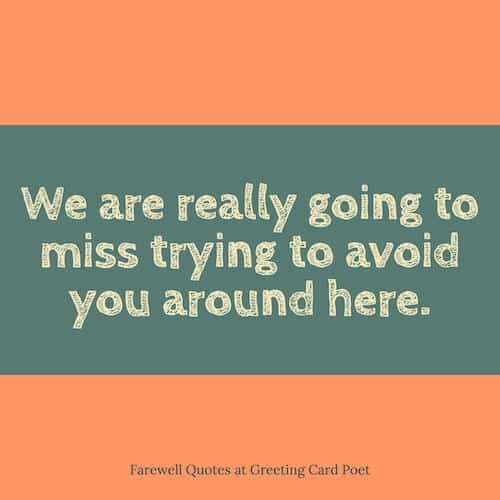 Bidding farewell to a friend, loved one or a colleague can be hard, but it is an essential part of moving on in life. All goodbyes, no matter how painful they may be, do carry a promise of good things. It may be hard to bid farewell to someone, but when the right words are used, the moments can become memorable. 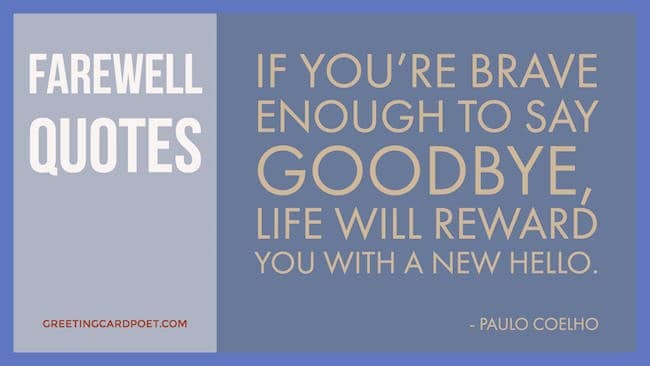 Some of the most successful people have said beautiful and deeper things about farewells. 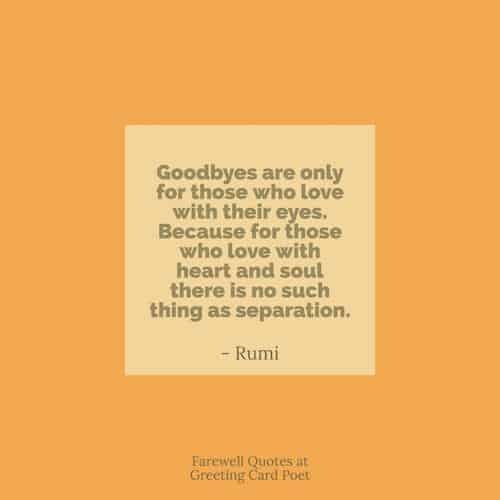 Here is a list of fond farewell quotes and sayings from some famous and some not-so-famous folks. Use the right quotes for the right person. We started with a simple hello, but ended with a complicated goodbye. You and I will meet again,When we’re least expecting it,One day in some far off place,I will recognize your face,I won’t say goodbye my friend,For you and I will meet again. Let’s promise each other. Farewell! 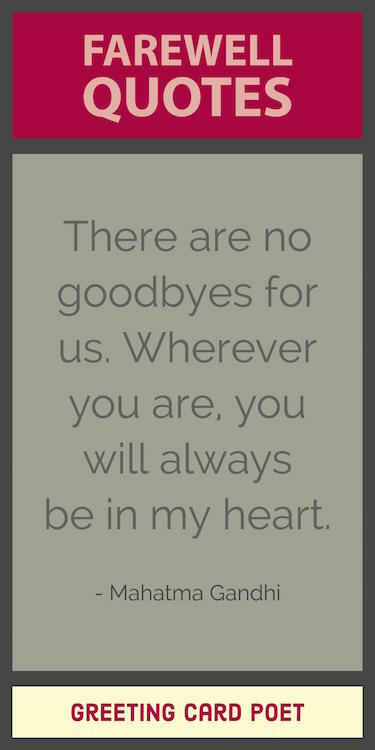 Tip: Consider using these farewell quotes as photo captions on Instagram, Facebook and other social media. Coming to work every day and not seeing your chirpy face will be a painful anguish. But the fun memories we’ve shared at work will never diminish. Farewell. I took a long breath when I heard you were going and said to myself ‘Thank God’. But now I realize that I will miss you and your funny jokes the most. When you will go, I shall miss your face when I am dreaming; I just hope I don’t wake up screaming. More than wishing you good luck for your future, I want to wish your next companions good luck. Believe me it was difficult living with you. Now that you are going, we will have a neat and clean premises were we can walk without having to step on books and toothbrushes. But you shall be missed. More funny friendship quotes. We’ll meet again,Don’t know where, don’t know when,But I know we’ll meet again, some sunny day. As you move outside the cold walls of the office, we can’t wait to begin a warm friendship on the outside. In the journey of life you meet several people who are hard to forget. I am glad to meet a person like you. Hope the path ahead is smooth for you and you reach your goal without a fuss. Farewell! Goodbye would have been a little less saddening if I had someone else in place of you as my boss. Wish you could stay with us a little longer. Farewell! Thanks for all those times when you helped me in the tasks I wasn’t able to do on time. It will be difficult to fill the void created by your absence here. I am really going to miss you. Best of luck!. Having worked under a great professional like you was a life time opportunity. On your farewell, we would like to tell you that you have left a legacy that would be cherished till eternity. I have been really lucky to have worked under a great mentor like you, who was more than a teacher, almost like a friend. Having you as my boss has brought the best in me alive. Monthly targets and performance appraisals will come and go, but the memories of working with a colleague like you will stay in my forever… farewell boss! Other bosses give orders, you gave us direction. Other bosses give targets, you gave us a vision – Other bosses lead by authority, you have always led us by respect. Farewell to a true leader! Got some farewell quotes? Please let us know via the Contact page. Thanks. You’re on Farewell Quotes and Sayings.